Far-right and anti-Islam Dutch politician Geert Wilders declared Thursday his intention to hold a contest for cartoons depicting Prophet Mohammad, a blasphemous act for Muslims, the very same day he was back in court appealing his 2016 conviction for discrimination. 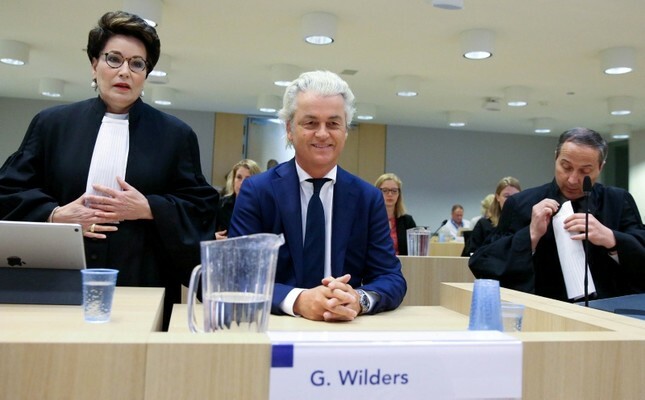 The far-right MP listened intently in the high-security court building near Schiphol airport as his lawyer urged judges at the opening to postpone the case, which Wilders has dubbed his "appeal witch-hunt trial". He argued his client was not being given "a fair trial" after prosecutors refused to probe Democracy party D66 leader Alexander Pechtold for recent critical comments against Russians. About 40 people -- mostly Dutch with Russian roots -- complained to the prosecution service after Pechtold told the public broadcaster NOS in February: "I've still yet to meet a Russian who admits his mistakes." "The comments by Mr Pechtold and Mr Wilders are legally comparable," said Knoops. "If one of them is prosecuted, the other should be as well." He urged judges to postpone the Wilders case so they could examine the situation around Pechtold further. NOS said the court would rule on the request later Thursday. After the 2016 verdict was handed down, Wilders vowed he would never stay silent, and has remained true to his word. He accompanied the tweet with a cartoon of himself standing outside a cell, watching an angry turban-wearing man inside, and likely meant to represent the Prophet Mohammed. And in another inflammatory move, he announced he was planning to organize a "Mohammed-cartoon contest later this year in the Dutch parliament with the world famous cartoonist and ex-Muslim Bosch Fawstin." He added that during the court's lunch break, an anti-Islam clip he has made entitled "Islam is Deadly" would broadcast on national television. A media-savvy politician, Wilders has used the court case and conviction to boost his image and popularity in the Netherlands. In line with other recent swings to the far-right in Europe, and following the election of U.S. maverick Republican President Donald Trump, the fortunes of his Freedom Party (PPV) have soared. Wilders put forward a fiery platform in the country's 2017 general elections, vowing to close mosques, ban sales of the Quran and halt the immigration of Muslim refugees. His PVV party came in second behind the Liberal VVD party of Prime Minister Mark Rutte and Wilders now heads the biggest opposition party in the Dutch lower house of parliament. His success was repeated in municipal polls this year, when his party also won seats in some 20 local councils, more than ever before.